We're proud of our company. This page explains why. Hall Bros (Fuels) Limited is a family run fuel oil and lubricants distributor based in Bridlington, East Yorkshire with a second depot near York. We supply fuel oils and lubricants to domestic, agricultural and commercial customers across the East Riding and North Yorkshire. As a long established family-run business and authorised distributors for both Pennine Lubricants and Jet (Phillips66) we take great pride in the quality of the products and service that we provide. Our focus on a fast, reliable and flexible delivery service alongside competitive pricing has allowed us to build up a strong presence in the area and an enviable reputation that extends beyond it. 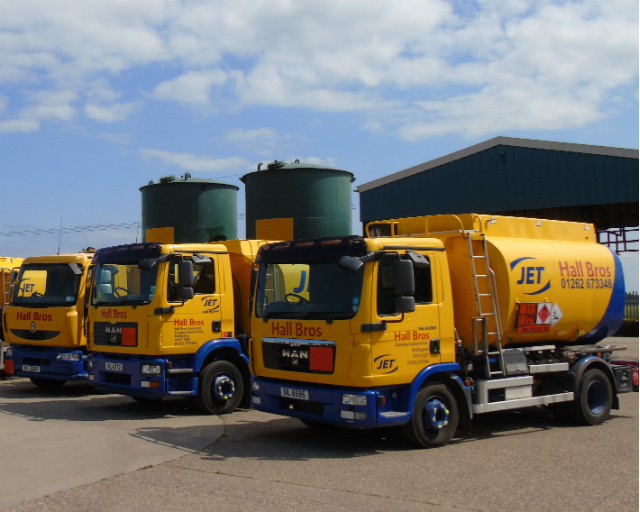 Our tanker fleet is made up exclusively of two axle tankers meaning that even our largest tanker can access a high proportion of delivery points but for instances where we need something even more compact we have several specialised smaller tankers. All of our tankers are driven by fully qualified drivers who know the region’s roads, lanes & villages well so we don’t need to place undue reliance on satellite navigation to find our way around. Our Gas Safe and OFTEC Registered parent company – Hall Bros (Bridlington) Limited - offers a wide range of additional services that are of great convenience to our fuel customers, including: oil tank replacement, pump-outs & gauges, boiler installation, servicing & repair, boiler bleeds, oil-fired cooker servicing & repair, power-flushing and general domestic plumbing. More information about these services as well as contact details can be found on the Services page. We started out in 1973 as the fuel department of long established engineering company Hall Bros (Bridlington) Limited, initially delivering fuel to fishing vessels on Bridlington harbour as a complement to our original specialism of marine engineering. Local demand for fuel oils allowed us to steadily grow and diversify our range of products and services as well as our customer base. Some 42 years on, we now serve a vast array of industrial, agricultural, marine, domestic and public sector customers across the East Riding and North Yorkshire, as well as still making regular trips to our old haunt Bridlington harbour. Hall Bros (Fuels) Limited began operating as a separate company in May 2005, in order to aid the expansion of the business and to provide our customers with the many benefits of dealing with a dedicated fuel and lubricants company. However, we remain a family-run business with the same key personnel and the same friendly and professional service that we have been providing to the region for over 40 years. Our parent company, Hall Bros (Bridlington) Limited now owns and operates a variety of companies/departments, providing a diverse range of services which includes crane hire and central heating services. More information about these companies is available at www.hallbros.co.uk. I'm proud of the personal touch our company provides. We genuinely care about offering a reliable service and go to great lengths to accommodate our customers' requirements.